Our Survival Worldwide animation visualises life table data from the Human Life Database maintained by the Max Planck Institute for Demographic Research (Rostock, Germany), the Department of Demography at the University of California (Berkeley, USA), and the Institut national d'études démographiques (Paris, France). A secret government agency has developed a scanner which determines whether a person is a terrorist. The scanner is fairly reliable; 95% of all scanned terrorists are identified as terrorists, and 95% of all upstanding citizens are identified as such. An informant tells the agency that exactly one passenger of 100 aboard an aeroplane in which in you are seated is a terrorist. The agency decide to scan each passenger, and the shifty looking man sitting next to you tests positive. Were you sitting next to a terrorist? What are the chances that this man really is a terrorist? A predictable pattern of murder? Violence in London attracts headlines. 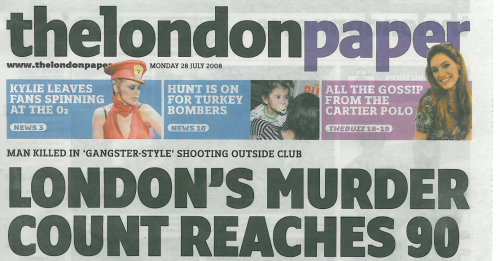 After four people were murdered in separate incidents in London on 10th July 2008, BBC correspondent Andy Tighe said "To have four fatal stabbings in one day could be a statistical freak". But could it? Read more about A predictable pattern of murder? What was the probability that Barack Obama would win the US election? On the face of it this seems an odd question. After all, he won. But before the election it was uncertain whether Obama would win, and probability is the way that uncertainty is quantified, so maybe it is reasonable to ask what that probability was. Read more about What was the probability that Barack Obama would win the US election? Through her work as a nurse in the Crimean War, Florence Nightingale was a pioneer in establishing the importance of sanitation in hospitals. She meticulously gathered data on relating death tolls in hospitals to cleanliness, and, because of her novel methods of communicating this data, she was also a pioneer in applied statistics. We explore the work of Nightingale, and in particular focus on her use of certain graphs which, following misreading of her work, are now commonly known as 'coxcombs'. We use phrases like "the probability of this coin coming up heads is 1/2", and "the odds on Manchester United winning their match are 2 to 1", and "the chance of dying of cancer is 30%". But what do these numbers actually mean? There are fundamentally different views about this, which can lead to very different ideas about how to deal with uncertainty. Read more about What is Probability? Why risk in the media? No-one can be an expert in every subject. We may have left formal science teaching behind at school, or have continued through university. We may keep up to date by reading scientific periodicals and websites - or just wish we had the time to do so! But as news breaks of yet another scientific discovery, we all start with what the media have made of the story, and how they present it to us. You bump into an old friend you haven't seen for years. You find that you share a birthday with not just one but two other people in your office. Why does anyone win the lottery?